This is the sixth volume to be published in "The Dickens Companions" series. Information is arranged in the form of notes presented for convenient use with any edition of "Hard Times". Short notes supply historical data on a variety of topics. Longer, discursive notes assemble facts and contextual information which students need in order to understand issues central to the novel. Thus, for example, details about food, costume and transport appear alongside notes about the political and social concerns of the day. To help readers find annotated material from the novel's text, "The Companion" provides in italics the opening phrase of the paragraph to which the annotation refers, followed in bold by the words or passage to be annotated and then the explanatory note. Readers of the novel in search of more information about a note or phrase have only to find the appropriate chapter in "The Companion", looking for the italicized phrase that identifies the paragraph and then the bold entry. This format makes accessible to any reader allusions that may seem otherwise dense or puzzling, as well as providing dependable factual information about the novel's historical and cultural background, especially helpful to students. Each book is the result of extensive research, making the series useful to the community of scholars interested both in Dickens and in all aspects of Victorian Britain. Margaret Simpson’s admirably thorough Companion can stand as a valuable supplement to paperback and scholarly editions, not least because a reader can keep it open next to the novel itself. Not even the longest on-page footnote could comfortably provide as much background on nineteenth-century labour relations as Simpson’s annotations, some of which are almost essays in themselves. Even more useful are the links made between the serialized sections of the novel and contemporary articles on similar topics in Household Words. But the incidental delights are also worthy of notice … this book is comprehensive without being coercive; it should prompt gratitude—and not just from research students engaged in one-upmanship. Margaret Simpson’s book is a cornucopia of interest and delight, the result of a great deal of resourceful and imaginative research. … This volume, however, is more than just a miscellaneous commentary. Through many of the entries runs the argument that Hard Times needs to be placed, for its richest explication, in the context of Household Words. The proposition is not new, but Simpson’s presentation of it is the fullest yet. … what this … reveals is the imaginative and sympathetic thoughtfulness which informs this Companion and makes it so attractive. It is a book full of facts, but they are deployed in no Gradgrindian spirit. Sixième volume d’une série de “companions” éditée par Susan Shatto et David Paroissien, l’œuvre de Margaret Simpson est, à l’image des ouvrages précédents, un outil de travail précieux pour les chercheurs aussi bien que pour les étudiants …Elle offre au lecteur une connaissance très étendue de l’époque victorienne incluant des sujets tels que le droit, l’éducation, la médicine, l’industrie et ses techniques de fabrication, le système économique et politique (l’utilitarisme par exemple) aussi bien que des sujets plus marginaux tels la vie des animateurs de cirque et le traitement des états dépressifs chez les femmes de la bourgeoisie. Les explications des références bibliques sont approfondies et examinent l’utilisation qui en est faire par Dickens et ses contemporains. … En outre, l’index est détaillé et pratique, la “select bibliography” de bonne qualité, et les illustrations éclairantes et bien analysées. 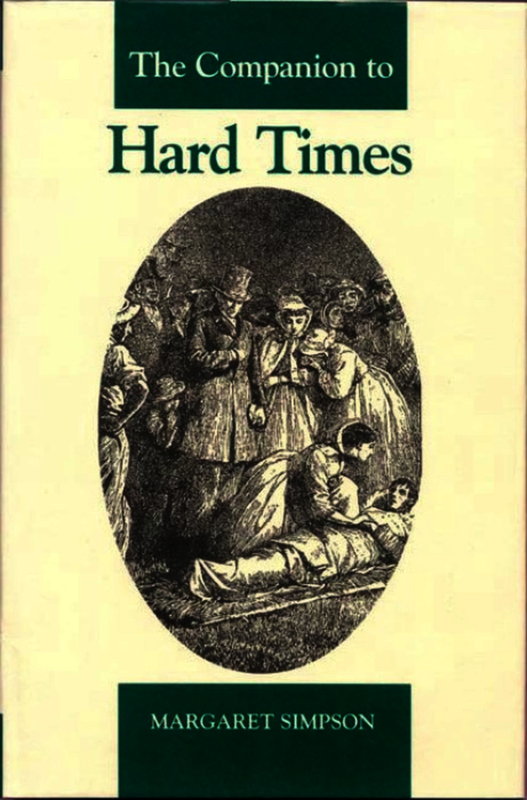 As I've indicated, everything necessary for the student of Hard Times is here in abundance: explanations of allusions, details of relevant political, social and cultural issues, and bibliographical material. All readers of Dickens's comparatively short but taut, intense novel will find this Companion an indispensable fund of information. Margaret Simpson received her PhD from the Queen's University of Belfast, where she has been an occasional tutor in the School of English. She has published articles and reviews on Dickens and on aspects of Victorian social history. This is her first book.